" On the wheels of luxury, to the world of fantasy "
Palace on Wheels isn't just the name of a luxury train in India, but it's the pride of Indian travel industry that makes its guests live, experience and share the elegance, sophistication and extravaganza of the bygone era. The Palace on Wheels facilities has taken the concept of luxury into a new dimension where every single aspect is precisely chosen to pamper the guests and to usher them with unparallel generosity. An ultimate paradigm of opulence in motion, the train offers the classy and chic facilities with an addition of a personal attendant who turn every wish of the guests into a reality even before they utter about the same. The following is a glimpse of the Palace on Wheels facilities that contribute towards making the journey all the more magical. After India got independence in 1947, all the royal rail carriages were ceased to be used. Because of their rich artistry on the inner walls, it was not possible to include these in the fleet regular passenger trains. It was only on 26th January 1982, that Palace on Wheels pioneered the tradition of luxury train journey in India and made its maiden voyage as a luxury steam engine train. This luxury Indian train started operating in a regular basis from October 1982. 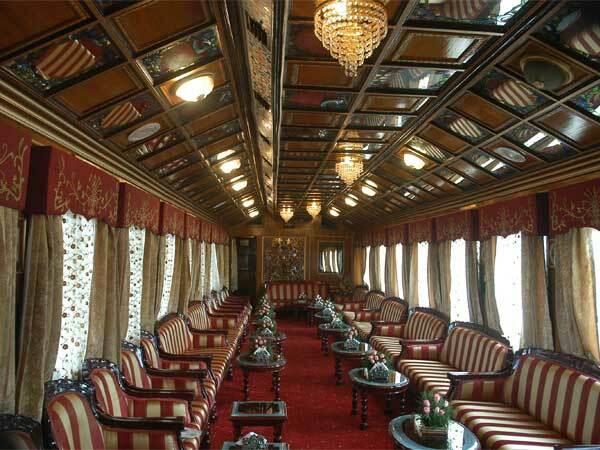 When luxury marries elegance and gracefulness, Palace on Wheels accommodation takes its shape. The 14 fully air-conditioned sedans are decorated in a way that offer solace to your visual senses and at the same time pampers your body and soul. Wall to wall carpeting, use of rich fabric, availability of avant-garde facilities, royal furnishing, comfortable padded beds and chic en-suite bathroom are just few of the details that make each Palace on Wheels cabin a deluxe abode onboard. 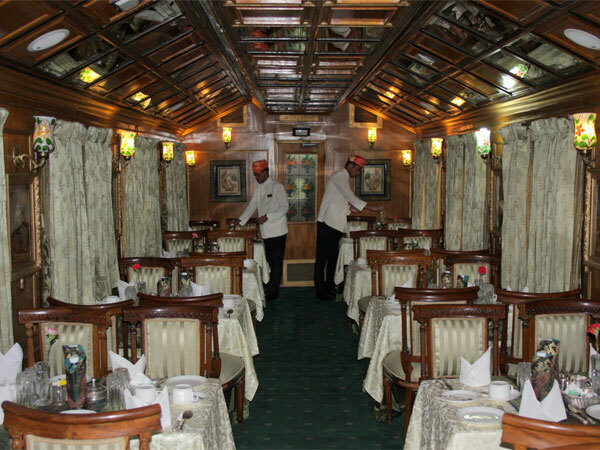 The Palace on Wheels dining experience is as extravagant as the train itself. Maharaja and Maharani, the two regal class restaurants onboard serve cuisines from around the world along with offering some signature dishes from the Rajasthani culinary tradition. The welcoming ambience accompany well with every particular dish that the restaurant stewards serves on your platters. The master chefs of the restaurants use fresh seasonal ingredients to prepare tantalizing dishes which are rich both in taste and aroma. Take delight of the ever changing panorama of Rajasthan or just get engaged in a friendly talk with fellow passengers over a glass of wine in the lavishly appointed bar onboard Palace on Wheels. The freshly prepared snacks are also there to accompany each glass of your wine or spirit. 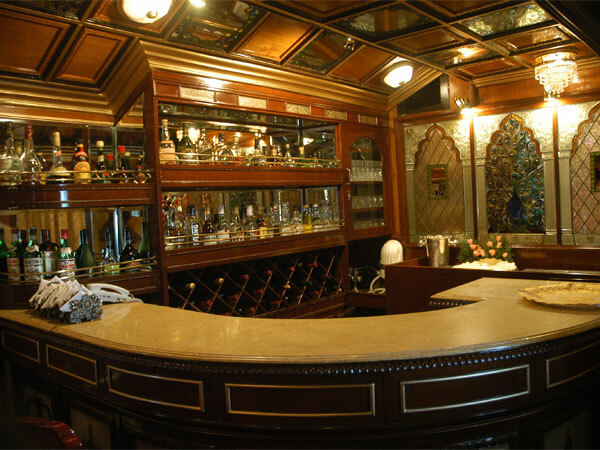 This onboard deluxe bar serves variety of beverages both from the Indian and international brands. Palace on Wheels BarLuxury means totality of comfort and lavishness; thus to offer the guests a complete royal experience, the Palace on Wheels houses a rejuvenation car also. Take delight of a rejuvenating spa session after a daylong excursion; make your body and senses feel the blissful treatments that the expert spa therapists offer onboard. To enjoy a revitalizing treatment onboard amid royal ambience certainly elevates the charm of your journey to its apex. While traversing through the plains and hills, you can spend some utterly relaxing moments in the lounge car of Palace on Wheels. Designed to offer the best of relaxing ambience, this sitting lounge is a great place to socialize with other fellow passengers or to plunge into some rich literary works. You can also take part in a host of exciting onboard recreational activities in this lounge car only. To make your journey experience all the more extravagant, the Palace on Wheels has introduced the concept of Khidmatgar or personal attendant. All the personal attendants are specially trained to offer you the best of hospitality services and to make your every wish come true. As it is said earlier that every aspect of Palace on Wheels facilities will make you surprised, so the beginning of the journey also is no less than a beautiful astonishment. Every passenger is offered an arrival kit as they check in to the train. The kit consists of stationary items, broachers and cards etc. If you want anything additional, you can ask that from the personal attendant who will be at your service round the clock. Understanding each need of the guests, the facilities are molded on this regal class train. An array of indoor games such as chess, Chinese checker, cards, carom board and crossword puzzle are available onboard. Moreover, if you wish to get engaged in a debate, you can also do that in the sitting lounge of the luxury Indian train. To make you stay connected with the world, the train offers you daily newspapers and magazines. The leading newspapers will greet you every morning accompanied by a cup of hot tea. A journey to the heartland of India is probably incomplete without having a glimpse of its cultural extravaganza. Thus the off-train excursion is also studded with dazzling cultural evening at Jaisalmer and light & sound program at Chittorgarh. If you wish to celebrate your special moments such as anniversary, wedding or business events onboard, you can do so with prior information. The event management team of the train will provide you all kinds of assistance to make your special moment all the more extraordinary.